New Next Books Newsletter Say Hi! Do you have any tips for aspiring writers? Join a writing group such as Romance Writers of America. They have chapters all over and there are tons of online writing groups to join. The more experienced writers are usually happy to share their knowledge. Most of all: write, write, read and write some more. Set goals for yourself to write at least one page a day. Just think, at the end of a year you’ll have a full length novel! Even if you think it’s crap, keep writing. Nora Roberts has said that she can work with a page of bad prose, but she can’t do anything with a blank page — and she’s right. Good luck! How do I get published by your publisher (Avon)? Eloisa's Newsflash is nothing-but-the-news. It comes from her team right to your inbox or the feed reader of your choice, and tells you there's a new book, new cover, an excerpt, book sale or other news. This is different from the Newsletter and requires a separate subscription. Eloisa really loves writing her Five Fabulous Things newsletter, a short and sweet list that ranges from book news to personal photos. Five Fabulous Things will land in your inbox approximately once every two to three months (sometimes more frequently, sometimes less — it all depends upon the writing schedule! 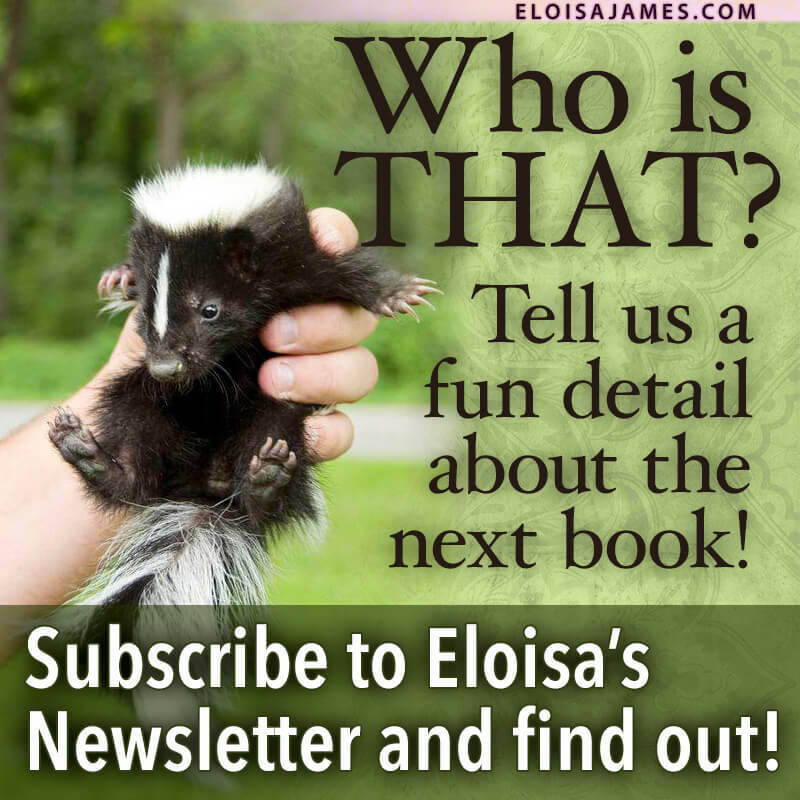 Please note that Eloisa's Newsletter and Newsflash are different mailings and require separate subscriptions.